This photo showcases snowmaking efforts on Arapahoe Basin Ski Area's intermediate, lower-mountain "Ramrod" run. Tuesday’s tricky winter weather has resulted in some new ski trail treats for skiers a day after Halloween. On Thursday, Arapahoe Basin Ski Area will open its lower-mountain, intermediate “Ramrod” trail for the season. At A-Basin’s Continental Divide neighbor, Loveland Ski Area, the intermediate “Spillway” trail off of the top of the new Chet’s Dream lift will also open. The opening of Ramrod at A-Basin bumps the ski area’s number of early-season runs up to two, as it joins “High Noon” to provide skiers and riders access to the primary, intermediate lower-mountain runs that service the 719-foot-vertical-rise Black Mountain Express lift from top-to-bottom. With the completion of snowmaking to open High Noon and Ramrod, the ski area’s attention now turns to the upper mountain terrain. “We just had a awesome night of snowmaking,” A Basin COO Alan Henceroth wrote on his blog on Wednesday. “We received 4” of natural snow and the wet bulb temperature got down to 14F, absolutely ideal snowmaking conditions. Ramrod will open Thursday. The next push is to get Lenawee Mountain Lift open. The snowmakers already have a big jump on Lenawee Traverse, the path from Black Mountain Lodge to the bottom of Lenawee Lift. At Loveland, the opening of Spillway brings the ski area’s total number of open runs to four, joining the adjacent beginner runs “Catwalk,” “Mambo” and “Home Run,” also accessed via Chet’s Dream. 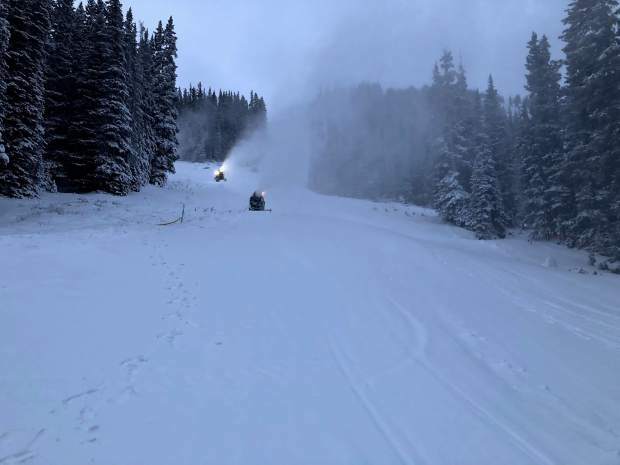 With the initial opening of those three runs on Saturday, Oct. 20, Loveland opened terrain spanning over a mile in length and containing nearly 1,000 vertical feet.